Firstly, I would like to apologize for not visiting you guys lately or have missed out visiting anyone of you! I've been extremely busy and don't have much time for any baking but just some simple meal for my family. Though, under my children's request I did a quick one a couple days ago, at 12am in the morning! *_* It only took me half an hour to complete the whole thing....so, it's OK! And here's what I did. 130gm graham biscuit(I used tiger biscuit), crashed finely. 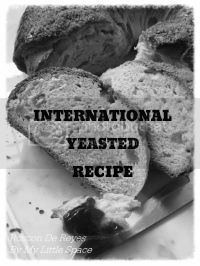 - combine all ingredients and mix to combine. - then press the mixture to a 8" spring form pan & keep chilled. 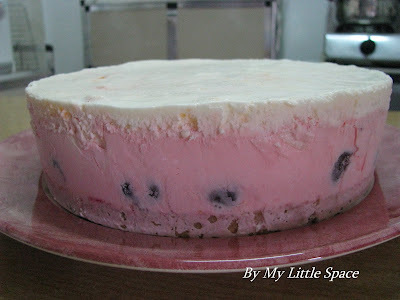 - beat ice-cream untill creamy and then pour half portion over to the biscuit crust base pan. - throw in all the dark cherry & marshmallow. - and then cover with the rest of the ice-cream about 3/4 of the pan. 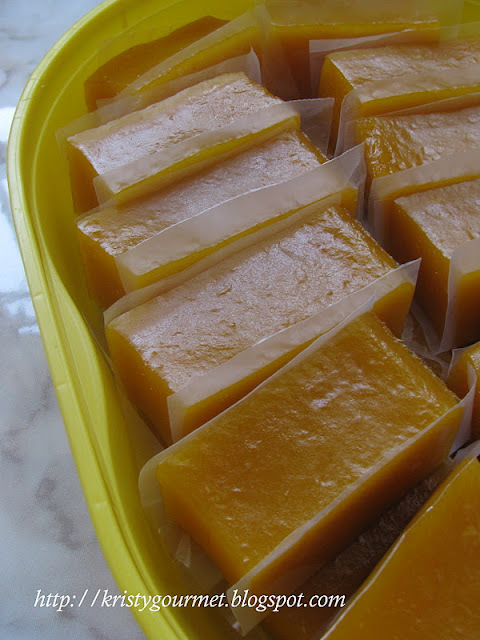 - Freeze untill set before top with 1 cup of apricot ice-cream to have a smother surface. - again freeze to set before serving. Just look at those melting ice-cream....almost everywhere! I did cut the cake as quickly as possible. Yes, it's a very challenging task! haha.... After slicing the cake, I put them back into the freezer. They still look great after that! You know what happened? My son kept on telling me that he doesn't like the cherry but he ate at least 4 slices. I handed 2 slices over to my neighbour. Her daughter was so excited! I only have one slice for myself. Happy Belated Sweet 16th to your girl ! Wish Happy Belated Bday to your girl for me, Kristy:D She is very pretty indeed! Takes after her mummy huh? Beautiful icecream cake! Happy Belated Birthday to your sweet girl. Just chilled? Won't melt in the fridge? I thought ice creams need to be freezed in the freezer. Your girl's so big already? Wah. BTW, it's nice to have kids around to love all your cooking. sounds very new n interesting. Gonna try soon. Hi Kristy, happy belated birthday to ur gal, wow ur gal so big already ar? Such a sweet and pretty young lady. I like your pink rocky road ice-cream, looks so yummy! What a dreamy cake, Kristy! Apricot ice cream??? YUM. Did you make it? I'm going to Google that and see what comes up. Can never say it enough - HAPPY BIRTHDAY!!! How sweet...I love the marshmallows tucked away. What a great way to celebrate and so exciting for the future. Smallkucing : Just pack your things & move over! hehe.... So, what about your daaaahling? Jeannie : Thanks alot! Haha... ya ya... Seriously, she looks very much like me and so is my boy! Anncoo : Thanks, dear. Glad that you like the cake too. Wendy : Haha... sorry! I've been pretty sleepy lately...Changed it already! So remember to freeze your ice-cream lol! Thelacquerspoon : Don't worry! Just come over for some. Do remind me of your birthday lol! Jay : Thank you & glad you like it as well, dear! Barbara : Yes, that's the ready-made apricot ice-cream! Don't worry...there's always a way to make it. Btw, thank you so much! Thank you everyone for stopping by and also for the greetings. Hope you all will enjoy the ice-cream cake too! And have a fabulous day. How yummy does that ice cream look! Yea! Happy Sweet 16th! I love birthdays, but I think I might love your ice cream cake more! wow! I hadn't even thought about trying to do this at the house! Yum! 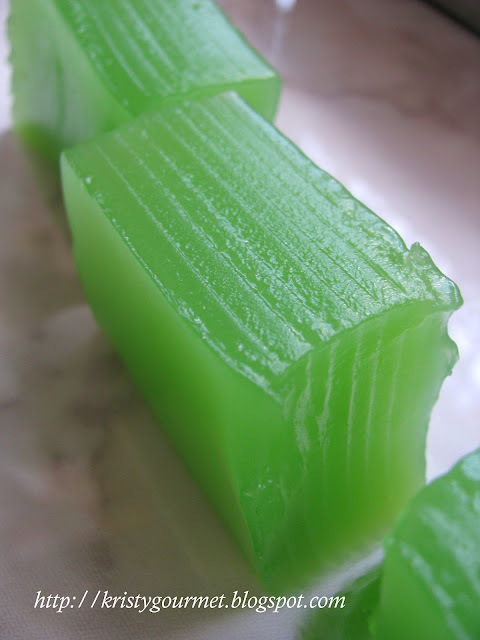 My girls will go crazy over this recipe! Happy sweet 16, and a very happy father's day to your husband. I hope you had a nice weekend and some time to relax. Oh my gosh! 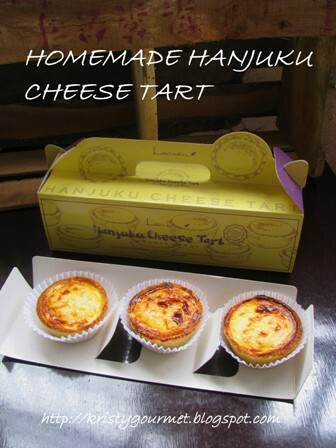 This is a must try for sure! It looks sinfully delicious! Happy sweet 16 to your daughter! Aawww! That is perfect for the occassion! Birthday wishes to your baby girl! Happy Birthday to your gal! The ice cream cake looks yummy and right for now! Warmest wishes to the birthday girl. The cake looks great! Happy belated birthday to your girl! Sweet young thing. Your ice cream cake is lovely! Happy Belated Birthday! Wow, I would have loved to have had a slice of this gorgeous ice cream cake. This is incredible! Belated happy birthday to your baby girl. Like me I still call my son baby. They'll always be our babies. Fantastic looking ice cream cake, I'm sure it taste wonderful. I wish I was you neighbor. When things calm down a bit, drop by my blog and join in on the fun. We're playing the Picnic Game! Happy Birthday to your beautiful daughter! 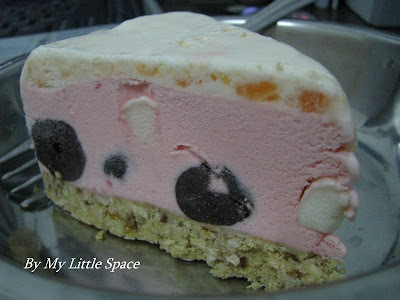 And the ice cream cake looks scrumptious! So pretty with those cherries! A lot of things to celebrate! I'm sure the celebration was a success with that gorgeous ice cream cake! So beautiful! I had no idea you had such a grown up daughter! congratulations! Happy birthday to your daughter Kristy, she is so pretty. What a perfect cake to celebrate her sweet 16th. Happy Belated Birthday to your sweetie. Birthday girl must be very pleased! Oh dear, seriously... I missed your dessert recipe badly! I love ice cream cake... I think I would try to make one for my girl, it looks quite easy for me... hopefully(fingers crossed)! Un gâteau glacé délicieux. Bravo! Wow, the ice cream cake looks so good! Especially with rocky road ingredients. Yum! Oh Kristy I'm so sorry, I can't believe I missed this post! Happy Sweet 16 to your baby girl!!! She is beautiful! How nice for dad you got to celebrate with him at the shop! Mine will be 16 in November right around Thanksgiving. I can't believe you can just whip that up...okay what am I talking about...I'm not surprised! It's a beautiful cake...to bad I'm late for the party! Beautiful cake! Happy Birthday to your beautiful 16 year old!! Penny, Grapefruit, Peanutts, Patty, Divya, HH, Pam, Shirley, Angie, Kait, Cheah, Bridgett, Louise, Fimere, Kak Elra, Pranis Kitchen, Tigerfish, Claudia, 3 Hungry Tummies, Reeni, Mary, Nadji, Sook, Shirley(BS) &Miranda! Von : Thank you! How I wish to share this with you. Madin : My boy stopped letting me to kiss him on his cheek by 10! He said it's embrassing. haha... Oh yes, my boy is growing up. He's a shy boy! Silvia : Oh I didn't tell you about my girl! My daughter is 16 and my boy is 13. Alice : I'm sure you can do this and Juan Juan going to love this for sure. Lyndsey : It's alright! Don't bother about it. I'm quite tire too. Hopefully be able to get enough sleep soon. It's 11pm and my eyes are closing up. Need a few toothpicks to support the lids. =D hahaha... Good night! Thank you so much everyone for stopping by. Hope you're all going to have a fabulous weekend. Hi Tana, thanks alot and nice to hear from you, dear friend. My hubby loves rice not fried rice. hehe... Since I didn't cook for that day. So I get some leftover rice from the fridge and fried it. Both my kids' b'day fall on Sept. Maybe I should make this cake for them since kids love ice cream!!! 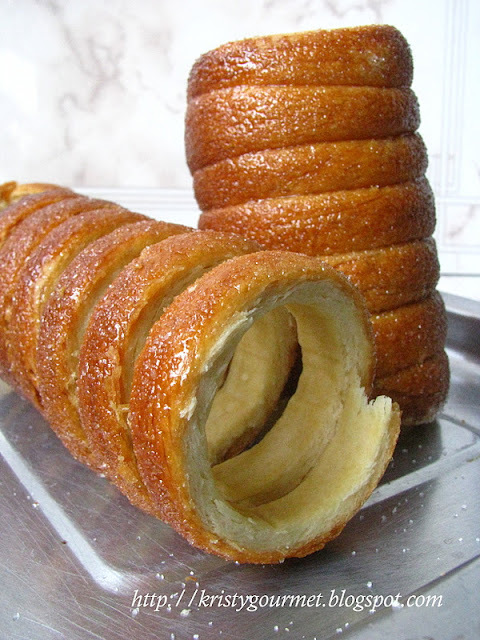 Look pretty simple to do but not too sure if I can whip this up or not because I've never bake before! Hi mNhL, welcome to my humble little space and thanks for visiting! There's no baking needed in this recipe. Just a simple & quick one! Kids love this alot. All the best to you and have fun! hi Kristy, i came to know this from mNhL post..ehheee. 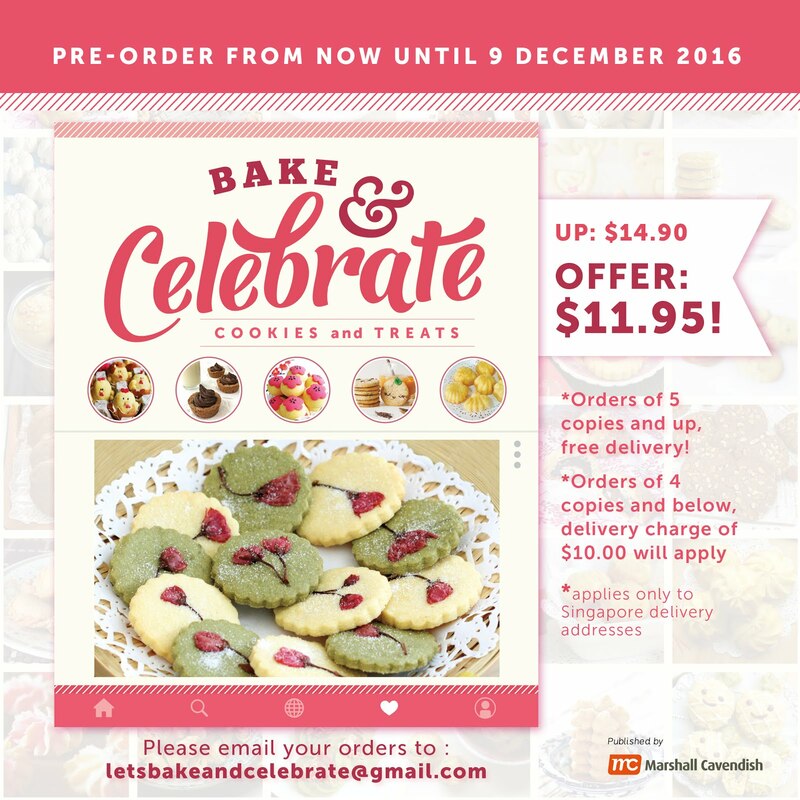 then i read and read few times to get the recipe... wonder whether i can do this or not.. my kids will love it too.. :) if troublesome, just buy one tub of HD back to eat..hahaha..
Claire, you really huh! I can not say a thing already! hahaha.... So, why you still wasting your time reading the recipe? haha.... Hey, just kidding! It tastes completely different thing when you added in all those yummy fillings especially marshmellow! Hope you will enjoy it. Hey, maybe even your daughter can make the cake. LOL! Enjoy your day. Kristy: If i would change to chocolate ice cream. Is it still taste good with marshmallow? any fruits i can put to make the best taste? Disgestive biscuit taste better or tiger for the base? AngelineBK : Hi there, welcome to my humble little space. Thanks so much for your sweet comment. OK now about your questions! (1) marshmallow goes well with any ice-cream. So, it isn't a problem at all. (2) do you mean by fruits to go along with chocolate ice-cream? I think blackberry or dark cherry should be fine due to the strong flavour of the fruits itselves. (3) personally, I prefer tiger butter biscuit (the round ones). 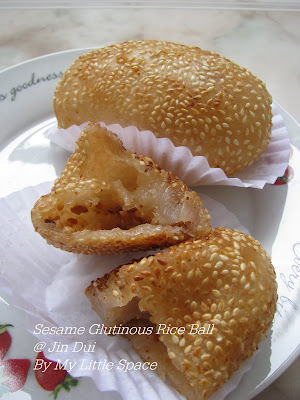 Digestive biscuit is less flavourful but the texture is really fine & it's perfect for the base. Thanks for visiting. Hope to hear from you more often. Kristy thanks for the fast reply. 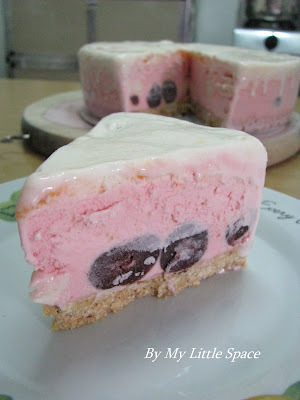 Another question here, i would like to add a layer of chiffon cake within the ice cream, how can i do it? AngelineBK : No worries! That is pretty easy as well. If you want to add the sponge in the middle, pour in the melted ice-cream first then place in the sponge and again pour in the other half of the melted ice-cream. After that quickly place the tray in the freezer. If you want the sponge to place at the bottom, just do the same. 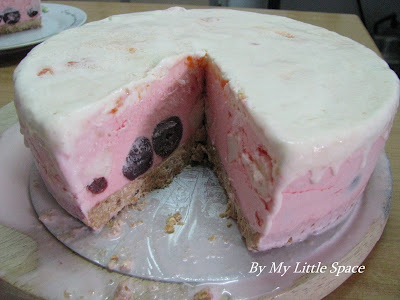 Here's another link to my ice-cream cake recipe with sponge.